In this era where less and less is made in the United States and corporations decide what choices we will have, it's wonderful that you can still build a boat for yourself that is lighter, faster and more beautiful than anything spit out by a big company. I'm often asked, "Can I build one? I don't have a lot of woodworking experience." I say, "If you thought about building one, you can! Building a boat never even crosses the mind of someone who can't." Desire and tenacity will overcome lack of skill, and you will learn all the skills you need, building this boat. And when you are finished, you will be rightly proud of what you have done. And what you have learned, is that you can do a lot more than you ever imagined. The skills you learn and the power of what you CAN DO, will flow over into other areas of your life. New Updated --Shop Tips page has information all strip builders should know! 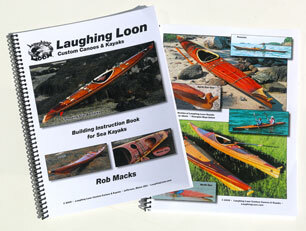 Over 4000 sea kayaks are being built around the world from Laughing Loon plans. Kayaks are being built in: the Caribbean, Brazil, South Africa, Saudi Arabia, New Zealand, Australia, Japan, the South Pacific, Finland, Sweden, Norway, Russia, England, Ireland, Holland, Germany, France, Slovenia, Switzerland, and Italy. And of course all over Canada and the United States, including Puerto Rico. And the list is growing. I have been truly amazed at how much interest there is in sea kayaking around the world. I am very proud of the overwhelmingly positive response of people to my kayak designs. I do a number of things differently than most other builders. I have a quite a few tips to make strip building easier for you. The big three tips are: use 3/16" strips, use northern white cedar for your hull bottom, and use a heat gun to bend tough to place strips with ease. For more details follow this link. I have received a great deal of positive feedback from builders saying they found my plans to be clear and easy to follow. I have written these plans describing in detail how I build wood-strip boats. My assumption is that folks buying my plans have not built a boat before. I have worked step by step through these instructions to make boat building accessible to you. I desktop publish my book which allows me to continually add new ideas and methods once or twice a year so, you have every new innovation. My NEWLY UPDATED Kayak book includes 90 pages of instructions with over 200 illustrations and photographs of work methods and jigs. I provide a materials list, and all my sources for woods, resins, fiberglass cloth and hardware. AND I give you all the tricks and secrets that make building easy!!! All the great innovations Rob pioneered are included, such as stapleless stripping using hot glue, bending strips with a heat gun and magnetic hatch covers! Get the most evolved methods from the source! Use it in addition to any other designer's instructions to build your stripper kayak, faster and easier. $25 plus shipping. Building time for the kayak designs is approximately 300 hours. Materials cost is in the range of $500 to $700 US dollars. I give you the experience of my building advice and my materials sources to save you a lot of leg work. My hope is for you to be successful and to enjoy building your Laughing Loon kayak. Full scale station, stem, cockpit, and hatch patterns. No lofting required. Over 200 photos and illustrations of work in progress. The Kayak Book described above - 90 pages of detailed instructions. Time saving jigs are diagramed. A materials list and materials sources list are included. A list of tools I find helpful is provided. These instructions are very detailed, with many new photographs and elaborate illustrations to make the building process clear and easy. Construction methods have been simplified and there are new tips and strip building secrets revealed. There are extensive source listings for materials, woods, and tools. I give you all my sources so you don’t have to waste a lot of time searching for materials. I explain wood strip building in a way to insure your success. My instruction book includes a tutorial on working with epoxy resin and fiberglass cloth, which reveals a simple method to produce transparent, beautiful, results. I explain epoxy resins and suggest how to best use them to keep the weight of your boat down. You may order the newly updated “Building Instruction Book for Sea Kayaks” separately, to review the process and decide whether you will go on to build one of these beautiful boats. 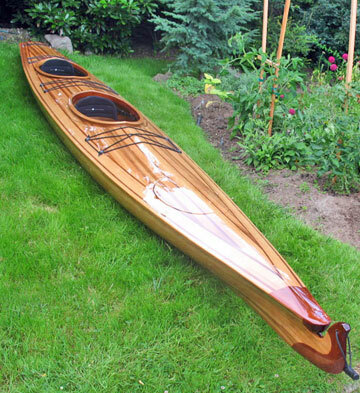 If you are not sure if you can handle this project or just wish to review the instruction book before buying the full plans, then purchase the “Building Instruction Book for Sea Kayaks” and I will deduct $25 from the full plans cost if you wish to go forward with building one of my kayaks. NEW! For those of you who love the intriguing look, and are excited about the outstanding paddling characteristics of my baidarka designs, but are afraid they may be too difficult for you to build, I’m now including the stern station template for my baidarkas WITH the purchase of the instruction book. So you can now build the bow AND stern of the baidarka BEFORE committing yourself to the full project. Please tell me you are interested in building a baidarka so I will include these pages. If you then wish to buy the full plans set, $25 will be deducted from the cost. "Compliments for your plans and instructions! Building Georgian Bay with your plans was very easy, step by step explanations, helpful drawings, many tricks!" "Edgar, Judy and myself have just completed one of your Panache designs. It paddles even better than it looks." "Your directions were very easy to understand. Everything worked well with no problems." "I have built two of your Georgian Bay Kayak designs and I wanted to thank you for the great instructions and pictures you provide with your plans. You really know how to get your point across in an understandable manner and you also give some great tips! Using a sharpened scraper on the hull and deck really works great!!" "How well written your plans are and how well thought out is the design." "Your instruction manual is very, very good, and I felt well guided throughout the many steps. I am glad that you had the patience to really delve into the details, describing pitfalls and tricks, at every turn. I Love the magnetic hatches and am glad I took the time to follow your design on those (I feel the "shoe box" hatches that are on many home built boats are their downfall). The laminated combing is also very sweet, and solid! I often felt as though you were looking over my shoulder, which influenced me whenever I considered taking a short cut. My only disappointment is that I did not carefully "fair" the deck, but just dove into stripping it, so she has a bit of a "roman nose" at the front. Fully fitted out, she weights 68# (more than I had hoped, but still very manageable for this 60 year old guy). Though I intended to build the boat for "use" and not for "show", I think she came out awfully pretty." I am certainly willing to talk to other builders about this boat or strip building the "Rob Macks Way", so you may share my email address with others. Thank you again for a wonderful design and excellent guidance. Building the Baidarka Bow and Stern Video! Rob Macks shows you, step by step, how he builds his baidarka bow and stern parts to get you started on the right foot, stripping your own baidarka kayak. This applies to the bow and stern for any of Rob's Star line of baidarkas, such as the Shooting Star, Fire Star, North Star, or Twin Star. ..Ordering Kayak Plans ; which include two (four for Twin Star) 24" X 36" working drawings sheets of full scale boat templates AND the "Building Instruction Book for Sea Kayaks." Standard shipping is by US mail in the United States. Payment on foreign orders must be made in U.S. dollars. Visa & Mastercard credit cards accepted. Western Union Cash, in U.S. funds, is acceptable on international orders. Foreign bank checks must list a US affiliate bank on the face of the check. I am a one person business. When you email, or phone, you talk to me directly. No phone trees, no, "Please wait while I find someone who can answer that question." I want to talk to you to directly to give you my personal service to make certain you get what you want and to tailor my products to your needs. Or, phone in an order at 207-549-3531 I'm usually available from 8:30 am to 8:00 pm EST. You may leave your order, or a call back number, on our answering machine if I'm are not available. Please speak slowly and clearly. Give your phone number first, your credit card number and expiration date (if you wish) and your name and address. on what they have to offer.